On April 15, science journalist and Pulitzer Prize-winner Amy Ellis Nutt paid Amherst Regional High School a visit. She spoke to two of English teacher Sara Barber-Just’s classes, LGBTQ Literature and Journalistic Writing. Students in these classes had just finished reading Nutt’s newest view-changing work of non-fiction, Becoming Nicole. Nutt, an accomplished and respected journalist who now works for the Washington Post, won her Pulitzer Prize for a journalism story she wrote called “The Wreck of the Lady Mary,” while working at the Star-Ledger in Newark, New Jersey. During her visit, Nutt fielded a range of questions about her book, a story about a transgender girl, her identical twin brother, and their family. 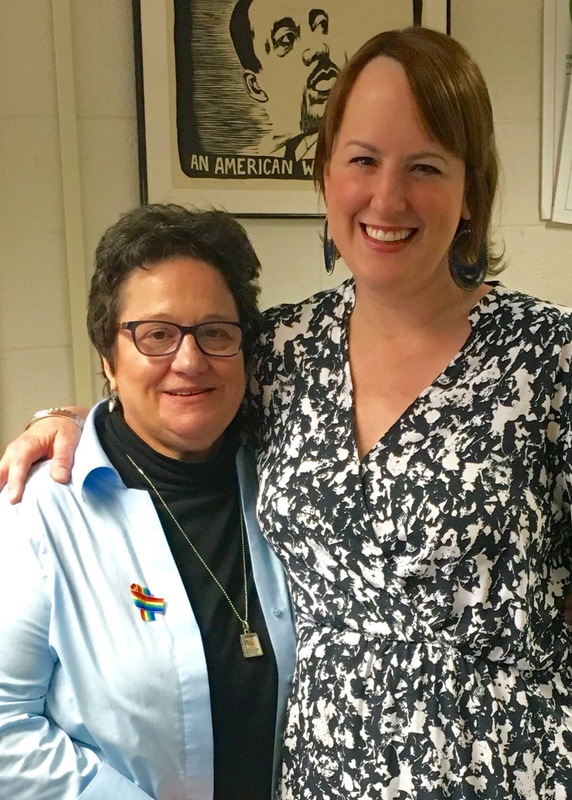 She also spoke about LGBTQ issues and answered in-depth inquiries from the LGBTQ Literature and Journalistic Writing classes about her career as a writer. Nutt made it clear that the Maineses were a typical, happy family and wished that people who have never met any transgender people could meet Nicole and her family, to put transgender issues into perspective. Throughout Nutt’s process gathering information for the story, she had to probe the family members to think back years and years, so she could include the smallest details in her novel. The father of the family, Wayne Maines, underwent a transformation of his views and opinions on transgender people throughout his daughter’s young life, which created difficulty when Nutt was interviewing Wayne about his early thoughts. “Wayne was brutally honest, but now it’s hard for him to read the first half of the book,” said Nutt, of the time when he was conservative and hung up on traditional gender roles. The honesty of the whole family throughout Nutt’s process was crucial. Nutt admitted that the book would not have been nearly as good or powerful if the Maineses did not share everything they could remember, even things they were not so proud of. In Becoming Nicole, a boy named Jacob and his old-fashioned grandfather do not approve of Nicole, formerly Wyatt, using the girls’ bathroom. Nutt spoke about this bully’s campaign to terrorize Nicole at school, and similar issues, such as recently passed laws in North Carolina and Mississippi that bar trans people from using the bathroom of their choosing. Nutt also had the chance to speak to Jacob and his grandfather, which she greatly appreciated, noting that she was able to hear different opinions which were so strong and unwavering. Nutt even disclosed that there were some details about Jacob and his grandfather that she did not include in the book because they were almost too harsh, and she did not want to turn them into villains. About halfway into Nutt’s visit, she began talking a lot more about gender identity, and informing students on the true meaning of gender identity and being transgender. Nutt described gender as a spectrum, saying, “Life is a spectrum, our bodies are a spectrum, why should our brains be any different?” Her view is informed by years of scientific research into genes and hormones, and how they affect sexual and gender identity development. Nutt shared some of the letters she had received about her book, some being very harsh and hateful, from people who are deeply prejudiced. Nutt gave an explanation to this prejudice, saying “our brains want answers fast,” and that we, as humans, like to categorize people as one or the other, and are “inherently confused,” by any in between. Amy Ellis Nutt spoke fluidly and clearly about her experience writing such a powerful book, as well as about issues in our every changing world. She hopes that her words and others’ can help our society progress. “Words can change minds,” said Nutt.